MONTPELIER, Vt. (March 22, 2019) – On Wednesday, a Vermont House committee held a hearing on a bill that would ban “material support or resources” for warrantless federal surveillance programs. This is an essential step every state needs to take at a time when the federal government seems unlikely to ever end unconstitutional spying on its own. A bipartisan coalition of 12 representatives led by Rep. Felisha Leffler (R-Enosburg Falls) introduced House Bill 493 (HB493) on Feb. 28. Under the proposed law, a Vermont government entity or law enforcement officer could not “assist, participate with, or provide material support or resources to enable or facilitate a federal agency in the collection of a person’s protected user information.” In effect, it would bar state officials, including police, from assisting federal agencies with collecting private electronic communications data except under three conditions. Pursuant to a probable cause warrant. Pursuant to a judicially recognized exception to the warrant requirement. With the person’s specific consent. HB493 is similar to a Michigan law that went into effect last summer, and passed out of committee in Missouri last week. Vermont could become the third state to take action to prohibit support for warrantless federal surveillance. In 2014, California took a smaller first step when Gov. Jerry Brown signed a bill banning the state from participating in, or providing material support or resources to any federal agency engaged in the “illegal and unconstitutional collection of electronic data or metadata.” The California law needs additional steps for effectuation by defining specifically what actions constitute “illegal and unconstitutional.” The Michigan law and HB493 go further by prohibiting specific state actions and give the movement to stop unconstitutional federal surveillance more momentum. According to a report leaked by a Republican congressional aide, the NSA recently ended a bulk phone data collection program operated under Section 215 of the PATRIOT Act. But make no mistake, surveillance continues under other “authorities.” The program that is reportedly not being used is only a fraction of the NSA dragnet, and the Patriot Act is only one source of “authority” for federal spying. In fact, officials have admitted that “a great deal of communications-related information collected under the executive order 12333.” This Reagan-era EO provides even less oversight and transparency than Section 215. And despite concerns about warrantless surveillance in the wake of Edward Snowden’s revelations, Congress has done nothing to rein in NSA spying. In fact, it has expended it. For instance, in January 2018, Congress reauthorized the FISA Sec. 702. A typical FISA warrant authorizes government surveillance on all landlines, mobile devices and desktop computers in a given area. While the process was created to monitor foreign agents, it sweeps up reams of data belonging to Americans. Because the federal government relies heavily on partnerships and information sharing with state and local law enforcement agencies, the passage of HB493 would potentially hinder warrantless surveillance in the state. For instance, if the feds wanted to engage in mass surveillance on specific groups or political organizations in Vermont, it would have to proceed without state or local assistance. This would likely prove problematic. Passage of HB493 would set the stage to end this sharing of warrantless information with the federal government. It would also prohibit state and local agencies from actively assisting in warrantless surveillance operations. The proposed law would effectively ban the state from obtaining or making use of electronic data or metadata obtained by the NSA without a warrant. Practically-speaking, the legislation will almost certainly stop the NSA from ever setting up a new facility in Vermont. 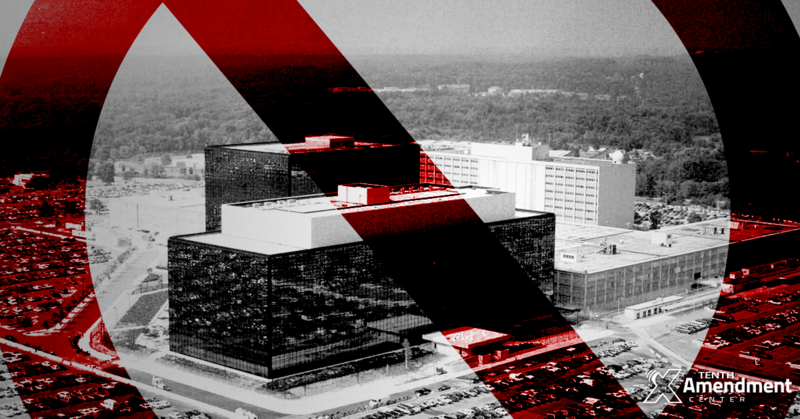 What will stop the NSA from expanding in other states? Bills like HB493. By passing this legislation, Vermont would become much less attractive for the NSA because it would not be able to access state or local water or power supplies. If enough states step up and pass the Fourth Amendment Protection Act, we can literally box them in and shut them down. HB493 rests on a well-established legal principle known as the anti-commandeering doctrine. Simply put, the federal government cannot force states to help implement or enforce any federal act or program. The anti-commandeering doctrine is based primarily on five Supreme Court cases dating back to 1842. Printz v. U.S. serves as the cornerstone.